to be honest, I've been "victim" to many cultures and foods, but personally I am a Canadian Chinese mix. Canada: Poutine, Tim Hortons Iced Cap. choose only one? Pufferfish Sashimi. 1 order of Tokusen Rib Eye Steak served on a sizzling hot plate with garlic steak sauce, bean sprouts, string beans, corn and Japanese rice. Who says it's gonna be your last meal? Are we all atheists here? I would have a big Korean feast!! Let's hope the last meal is a fresh breath of Air. I happen to enjoy many cuisines - Japanese especially sushi, Chinese, Malay, Indian, Italian, you name it. If we are talking about comfort food then a nice plate of spaghetti and meat sauce, a glass of red wine, a nice leafy lettuce salad, and I'm all set. 1. 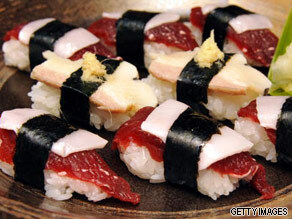 The "sushi" picture you have is either whale meat or horse. 2. This article is, at best, mediocre. What's the intent or purpose? that is plenty....need 2 days! I forgot, add one piece of to die for double chocolate and walnut chocolate brownie from MRS. FIELDS!!! I would like to have a Large Nan with tandoori chicken fillings and Yogurt salad with onions, tomatoes and lettuce..
Oi! I am Polish so I will go for California Roll!!! And a big bottle of vodka! PERUVIAN CEBICHE ! ! ! During my vacations in South America, the greatest dish I had was CEBICHE in Peru. If you love sashimi, you'll also be crazy about this dish. 1. Fish + Beef meatball in a soup of noodle + singapore noodle + very hot chilli sauce. 2. Tuna Mayonnaise Onigiri (from japanese/korean 711 is the best!) + KFC drum (original recipe NOT the crispy one). CNN, what's the matter with you?!? What kind of caption is "What would you make your last meal?" when the article is actually called "What's your favorite meal?" Such horrible manipulation. I thought this article would be about prison last meals...but its not! This is two minutes of my life that I will never get back. i would surely have a brazilian traditional dish called "feijoada", wich consists of a variety of pork, beef, black beans stew along with rice, vinagrette, oranges and of course a glass of caipirinha!!! When visiting NY I had a multi-course vegetablemenu at Gramercy's and it was spectacular what a taste vegetables have to offer. As an igbo lady from nigeria, My last meal would be pounded yam(fufu) and nsala soup with fresh fish(catfish) and utazi leaves!! I would eat 6 Lobster, plenty of guacamole, freshly made, with a hot salsa and a nice steak, well marbled, like Kobe beef nearly 2 pounds in weight. Followed by an endless bucket of Pho, with all the trimmings, merging into Crown Royale dessert, a whole bottle. Then it WOULD be time to say goodbye. A cynical and sick story that sends shivers up my spine. Being from a civilised country, where thankfully no one has to answer this question. the Ladies love preparing this Meal for Their Men. They feel like a True Gentlemen and their Ladies know It! pounded yam (fufu) nd nsala soup wth fresh fish (cat fish). It would have to be Maryland crabcakes, Malaysian satay and a Malaysian 'iced batu campur' to finish it off! acompanied by some delicious Malbec! As a nigerian girl, my best meal is banga soup made with dried fish, served with starch. Try it, u'll love it. Mc Donalds Big Mac meal. Pepper steak and froyo! Carrot cake from Singapore! Wonton noodles from hong kong! My Last meal : Lots and lots of Mexican food definitely! Some fried chicken chimichangas, refried beans, with sour cream! Some Authentic Mexican Tacos! A plate of Nachos, My mum's Crab Dip, Hoss's Salad Bar, Chili Cheese Dog, And a Chicken Korma Pizza! And for desert some Texas Delight cake and some Pecan Pie. It would take me days to eat my final meal, but then I think I could truley die fat and happy. A Halifax style donair, washed down with eggnog. You cant beat a chicken SHAWARMA with tons of TOUM...............!!!!!!!!!!!!!! And Im not even lebanese! hmm.as an african i wuld like 2 hav fufu served hot with a bowl of pepper soup with goat head.and in addition wit a light acholic drink in suport of it. This are d last tins i wuld love 2 hav as my last meal! In africa,our favourites are solid food and d taste of pounded yam and egusi elefo soup is awesome. Pounded yam with bushmeat will do for a Tiv girl from Nigeria. Pizza Prosciutto or "Holúbky" (stuffed cabbage). My request as a last meal would be 4 full jars of my sister's home-made pickles. Prime scots aberdeen angus roast beef topside with Maris Piper roast potatoes, roast peppers, roast parsnips, boiled carrots, sweetcorn, peas, broccoli, home made yorkshire pudding, home made gravy and horseradish sauce. With a keg of Doombar ale to wash the meal down, and me on my way to valhalla and eternal feasting. Possibly incorrectly prepared so that I get the best of death row. If it would be the last meal I would ever be able eat I would ask for pan-seared dodo breast. come on CNN. at least find a real picture of sushi and not some double stacked un-authentic nigiri. Try premium toro on perfectly cooked sushi rice. ¡Tacos de carnitas! With a bottle of Jarritos, either tamarind or mandarin flavor. As a real last meal, I would have something that gave me a cronic case of the runs. They would have to let me go again and again, forcing me to keep it in would be a cruel and unusual punishment. This is the most hilarious article I've ever seen! Man, people like the weirdest things, don' t they?! My daughter was a missionary in Nigeria and said that that soup they make there-banga soup-is the most horrible thing she's ever tasted! Oh my! and did that guy really mean that he would eat HORSE for his last meal??? Whatever! The world is such a varied place! I would eat of course the Israeli famous dish "Hara-Baleben"...yummy! Our original dessert is Brigadeiro, it tastes very good! To start Beluga Cavier / toast, followed by Lightly seared Foie Gras with orange sauce, Main Course Osso Buco with a bottle of Shiraz. Beefaroni. What the heck, I'm gonna die anyway. Tortilla Soup w/Chicken Soft Tacos from Alamo Cafe, I haven't had for years, but if I was going to die tomorrow, that is the dish I would ask for! Well of course that is easy! Persian food!! I would have Tah-chin; Rices cooked with chiecken and currents, with plenty of safrann. A little crunchy in the bottom so I can put yougart on it! Can tell I love food? Wouldn't matter...if it were my last meal I would be too upset to enjoy it!!!! Very large Alaskan king crab legs with a bucket of lemon, garlic butter. With Cheesy bisquits from Reb Lobster. An 18 ounce, 2" thick New York Strip with a very large side of hot, thick, wide noodles smothered in butter, lightly salted and with coarse ground pepper. A meal fit for a King. Pho, Acai Bowl, Homemade Macaroni and Cheese, Red Vines, Pinot Noir from Oregon and Bacon. Vanilla Tea with two sweet and lows and a soy milk topper. Also, a pack of cinnamon trident gum. These two things always aid my anxiety...I might be a bit anxious at this point! white yam and red oil. FOR STARTERS I WOULD PREFER SCOTTISH SMOKED SALMON WITH PIRA BREAD AND HUMUS. MAIN DISH IS CHATEAU BRIAND CAFE DU PARIS WITH SOUTH AFRICAN WINE. FOR DESSERT I THINK TROPICAL FRUIT SALAD CONSISTING MAINLY OF MANGO,WATERMELON, PINEAPPLE, PAWPAW, BANANA AND STRAWBERRY SPRINKLED WITH SCOTCH WHISKY AND FINALLY ICE CREAM LACED WITH LAQUER ( NOT LIQUOR ) LACQUER IS INDIAN HEMP INFUSED IN JOHNNY WALKER BLUE LABEL FOR A WEEK. My favorite dish is ofe onugbu with ogiri igbo(fresh)bitter leave and akpu . 1) What Canadian calls beaver tails their national dish? Has the article writer ever actually met a Canadian? I mean, they're good, but national dish? Really? 2) For me, a big plate of homemade nachos, with everything that would have killed me: lots of melted cheese and sour cream. Honestly,I will take eba and banga soup well flavoured with dried fish.A cold water will prepare the way also. 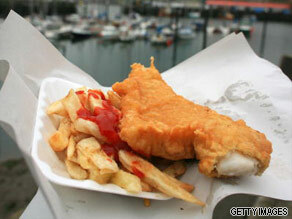 Well it's FISH N Chips innit. As an Aussie, it's a toss up between beef and seafood. So I'll go with two options. 1. Baked Tasmanian Salmon served with smashed, roasted potatoes and some fresh greens. OR 2. A big piece of Angus steak, served with homemade chips and salad. for me, it's not what i eat, but who i eat the meal with. i will eat at McDonald's with my favorite person any day over the best steak and lobster at the most fancy restaurant alone. I live on the U.S. island of Guam in the far Western Pacific and the indigenous people here, the Chamorros, have some pretty good food. I'm 1/4 Chamorro. For my last meal I would choose the Chamorro food of red rice (it is actually orange in color and not red), barbecue chicken and coconut milk for the drink. Mansaf, the Jordanian national dish which consists of lamb meat, yogurt and rice. Served in a big dish and eaten by hand. A Super treat. Hey I am a Japanese who living in Japan. "boiled hot rice and miso soup and Natto (made of soy beans)" please! For my last meal, I would have a lot of canned beans with sauerkraut, fried onions and boiled eggs with a couple of Canadian beers to wash it down. Guess why. A Kurdish dish named (iprakh) is rich of vitamins and very delicious. I recommend every family worldwide to make it weekly because it is very good for health besides it is extremely delicious. Entree: 2 LB. Maine Lobster w/drawn butter and the Porterhouse from Peter Lugar Steak House. 1961 Chateau Latour to go w/the steak. At that point I really don't think it would matter because I don't think it could be tasteful ,whatever ,you chocked down, preparing to Die..... Don't be to happy to pick your last meal. If we are lucky we don't have to choose... I'd be glad not to choose ..
For my last meal I would have meatloaf and mashed potatoes with brown gravy and green beans, and a nice cold beer. It would be about 4 lobsters for the first course,with lemon & butter. second course ,- would be griled cod fish,oven roasted potatoes with roasted green peppers,soaked in virgin olive oil, a traditional dish of PORTUGAL. Nothing better for your "last meal" than a nice Bolivian spicy pork fricasé, served on a bed of warm hominy with a side of black "chuño" potato...and some Paceño beer to accompany it. Yummm! Why on earth is this an important question. Is there something being planned that we don't know about yet? If you knew this would be your last meal, would you have apetite? My last meal on earth has to be about one dozen White castle hamburgers with mustard, large order of fries and one coke. I'm a Nigerian and my favourite food is fufu and 'Afia Efere' soup. The soup is a white soup full of goat meat. I'm already salivating. Assalam o alykum, God Bless All ! Biryani ( Rice mixed with chicken or beef or mutton ), Haleem ( meshed pulses mixed with beef or chicken) are a few to name among long list of high spiced dishes.............National dish ( im not aware of ?) can any one tell..